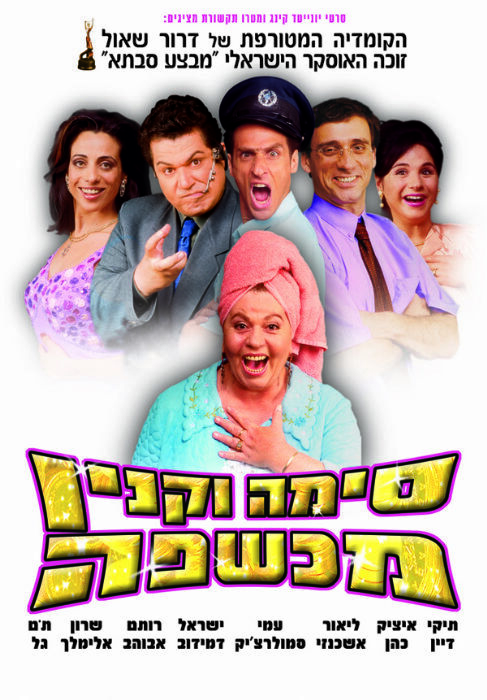 A comedy about racism in Israeli society. A housewife discovers she has supernatural powers. She becomes famous and runs for the office of Israeli Prime Minister. Sima Vaknin , a housewife who lost her husband a year ago, wants to enlarge her living room. Dov Vasserman, head of the tenants committee in her building, is the only neighbor that refuses to grant her permission to renovate. Sima puts an itemized curse on Vasserman, hoping to ruin his life. The curse materializes and Vasserman’s life is destroyed. His father has a heart attack, his sister breaks her leg, his house burns down, he loses his job and gets run over in a hit-and-run accident. The story becomes known all over Israel. Masses of people come to Sima’s home to ask her for curses and blessings. Avi Vanunu, Sima’s son-in-law, sees the commercial potential in Sima Vaknin’s powers. Along with his wife Etty, Sima’s daughter, and their 11 year-old son Bibi, he establishes a business for curses and blessings at sky-high prices. Sima Vaknin becomes rich and famous, and lands her own daily radio show, but in contrast to her family members who are happy about their new status, she cannot find peace with her real problem – loneliness and life without love. Right when it seems that Sima is developing a romance with a kindhearted man, her family makes her choose to walk the way of corruption, a choice that sets her on a path from which there is no return.